How do you choose the perfect cleaning product? From the myriad of available choices in type of equipment and the materials used to make them, one sets itself apart from the rest by being economical, environmentally friendly, and versatile. Microfiber is a synthetic fiber made out of polyester and polyamides that produces strands with diameters smaller than that of silk. When formed into fabric, it is used in a variety of applications, notably gaining popularity as a cleaning product in the early 1990s. Here are a few advantages to using microfiber in your daily cleaning tasks. Microfiber products are positively charged, which means they attract negatively charged dirt and grease by nature. What this means is that you can save money on janitorial supplies and cleaning solvents because there simply isn’t a need to use as much of them as you would when you use non-microfiber equipment. What’s more, microfiber is durable and reusable – it only loses its effectiveness after one thousand washings, which means that it will not be necessary to frequently replace products and equipment. Microfibers are made from a synthetic blend of polyester and polyamides, such as nylon. They have the thickness of 1/16th of human hair, and when woven together, create a net-like surface area that traps moisture and all kinds of debris. These millions of tiny spaces allow microfiber equipment to cover more particles and reach crevices and surface pores. Along with the aforementioned positive charge thanks to the nylon component, dirt and grime is easily pulled off of surface and into the microfiber strands when the fibers rub together. Microfiber equipment eliminates the act of continuous dipping and wringing when you clean a surface. There is no need to change the cleaning solution often - as long as you keep it uncontaminated, so avoid double-dipping. With these extraneous steps out of the way, cleaning can be done much faster and with ease, therefore jobs are completed more efficiently as well. Many cotton loop mops use heavy metal or wooden handles. People who use these kinds of mops are at a higher risk of hurting their backs or getting themselves injured. Microfiber mops are lighter than other mop styles, so they’re easier to use and handle. Microfiber equipment is easier to clean than most cleaning products. Grime and stains easily fall off after a little agitation due to the material it’s made of. Microfiber is both machine and handwash-friendly. They are also designed for easy maintenance: take the microfiber mop, for example. The head of the microfiber mop is detachable. You can throw it in the washing machine whenever it needs to be cleaned, and air dried once it’s done. You can’t do this kind of cleaning with a traditional mop. Microfiber equipment has been around for more than a decade and it has revolutionized the way we keep clean. Thanks to microfiber, even the most mundane tasks can be done in a snap. 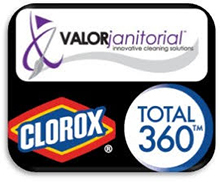 If you’re having problems cleaning your building and think that using microfiber equipment isn’t enough, contact Valor Janitorial today. We are a certified janitorial company that specializes in cleaning properties in Dallas, Texas. We have the manpower, equipment, and know-how to clean your surroundings, so give us a call at 214-238-9550 for a free estimate.